Manage a value from the portal or from the PowerShell command line that is used by runbooks or DSC configurations, such as a set of common configuration items like specific list of VM names, a specific resource group, an AD domain name, and more. Since Automation variables are persisted, they are available even if the runbook or DSC configuration fails. This behavior allows a value to be set by one runbook that is then used by another, or is used by the same runbook or DSC configuration the next time that it's run. When a variable is created, you can specify that it is stored encrypted. Encrypted variables are stored securely in Azure Automation, and its value can't be retrieved from the Get-AzureRmAutomationVariable cmdlet that ships as part of the Azure PowerShell module. The only way that an encrypted value can be retrieved is from the Get-AutomationVariable activity in a runbook or DSC configuration. When you create a variable with the Azure portal, you must specify a data type from the drop-down list so the portal can display the appropriate control for entering the variable value. The variable isn't restricted to this data type. You must set the variable using Windows PowerShell if you want to specify a value of a different type. If you specify Not defined, then the value of the variable sets to $null, and you must set the value with the Set-AzureRMAutomationVariable cmdlet or Set-AutomationVariable activity. You can't create or change the value for a complex variable type in the portal, but you can provide a value of any type using Windows PowerShell. Complex types are returned as a PSCustomObject. For AzureRM, the cmdlets in the following table are used to create and manage automation credential assets with Windows PowerShell. They ship as part of the AzureRM.Automation module, which is available for use in Automation runbooks and DSC configurations. Get-AzureRmAutomationVariable Retrieves the value of an existing variable. 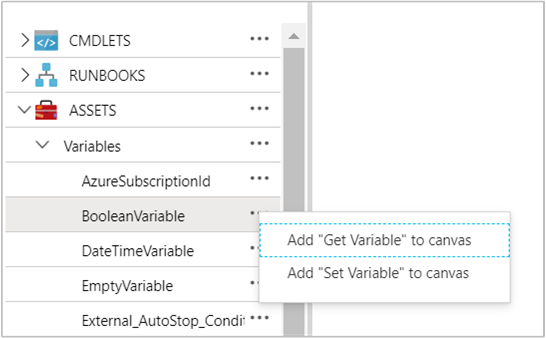 New-AzureRmAutomationVariable Creates a new variable and sets its value. Remove-AzureRmAutomationVariable Removes an existing variable. Set-AzureRmAutomationVariable Sets the value for an existing variable. The activities in the following table are used to access credentials in a runbook and DSC configurations. Set-AutomationVariable Sets the value for an existing variable. You should avoid using variables in the –Name parameter of Get-AutomationVariable in a runbook or DSC configuration since this can complicate discovering dependencies between runbooks or DSC configuration, and Automation variables at design time. The functions in the following table are used to access and retrieve variables in a Python2 runbook. automationassets.get_automation_variable Retrieves the value of an existing variable. automationassets.set_automation_variable Sets the value for an existing variable. From your Automation account, click the Assets tile and then on the Assets blade, select Variables. On the Variables tile, select Add a variable. Complete the options on the New Variable blade and click Create save the new variable. The New-AzureRmAutomationVariable cmdlet creates a new variable and sets its initial value. You can retrieve the value using Get-AzureRmAutomationVariable. If the value is a simple type, then that same type is returned. If it’s a complex type, then a PSCustomObject is returned. The following sample commands show how to create a variable of type string and then return its value. The following sample commands show how to create a variable with a complex type and then return its properties. In this case, a virtual machine object from Get-AzureRmVm is used. $vm = Get-AzureRmVm -ResourceGroupName "ResourceGroup01" –Name "VM01"
Use the Set-AutomationVariable activity to set the value of an Automation variable in a PowerShell runbook or DSC configuration, and the Get-AutomationVariable to retrieve it. You shouldn't use the Set-AzureRMAutomationVariable or Get-AzureRMAutomationVariable cmdlets in a runbook or DSC configuration since they are less efficient than the workflow activities. You also cannot retrieve the value of secure variables with Get-AzureRMAutomationVariable. The only way to create a new variable from within a runbook or DSC configuration is to use the New-AzureRMAutomationVariable cmdlet. The following sample commands show how to set and retrieve a variable in a textual runbook. In this sample, it is assumed that variables of type integer named NumberOfIterations and NumberOfRunnings and a variable of type string named SampleMessage have been created. Write-Output "Runbook has been run $NumberOfRunnings times." The following sample code shows how to update a variable with a complex value in a textual runbook. In this sample, an Azure virtual machine is retrieved with Get-AzureVM and saved to an existing Automation variable. As explained in Variable types, this is stored as a PSCustomObject. $vm = Get-AzureVM -ServiceName "MyVM" -Name "MyVM"
In the following code, the value is retrieved from the variable and used to start the virtual machine. $vmObject = Get-AutomationVariable -Name "MyComplexVariable"
The following sample code shows how to use a variable with a collection of complex values in a textual runbook. In this sample, multiple Azure virtual machines are retrieved with Get-AzureVM and saved to an existing Automation variable. As explained in Variable types, this is stored as a collection of PSCustomObjects. In the following code, the collection is retrieved from the variable and used to start each virtual machine. $vmValues = Get-AutomationVariable -Name "MyComplexVariable"
The following sample code shows how to use a variable, set a variable, and handle an exception for a non-existent variable in a Python2 runbook. In a graphical runbook, you add the Get-AutomationVariable or Set-AutomationVariable by right-clicking on the variable in the Library pane of the graphical editor and selecting the activity you want. The following image shows sample activities to update a variable with a simple value in a graphical runbook. In this sample, Get-AzureRmVM retrieves a single Azure virtual machine and the computer name saves to an existing Automation variable with a type of String. It doesn't matter whether the link is a pipeline or sequence since you only expect a single object in the output.